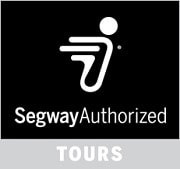 For self-imposed damages of the Segway PT, each participant is covered by a Segway hull insurance with €250,- retention. If there are less than 2 people attending the tour, we will cancel it 24 hours before the scheduled start time via email and text message. The tour will be cancelled automatically 12 hours before the tour start, when it is foreseeable that it will rain. In this case, you will receive a cancellation notice from us via email and text message. If it unexpectedly starts to rain shortly before the tour, it is upon the tour guide's decision whether the tour will take place or not. On demand, we will provide a free rain cape for you. - Sun glasses, sun protection etc.